Founders Day is a time to renew the dedication to the Purposes of the PTA that were defined by PTA’s founders more than a century ago. Each year in February, PTA honors the three founders as well as past and present PTA leaders. Through special programs and events, PTA also attempts to increase the awareness of its members and the community by highlighting achievements, activities, projects and goals. The Founders Day celebration was created in 1910 by Mrs. David O. Mears, a charter member of the National Congress of Mothers founded by Alice McLellan Birney and Phoebe Apperson Hearst in Washington, D.C., February 17, 1897. The Founders Day observance has continued through the change of organization names in 1925 to the National Congress of Parents and Teachers, and the uniting in 1970 with the National Congress of Colored Parents and Teachers, founded in 1926 by Selena Sloan Butler, to become the National PTA. Cleveland PTA celebrated Founder's Day on February 13th for the 2018 - 2019 school year with a record attendance at our association meeting in the cafeteria! We look forward to celebrating with all of our members in the years to come. 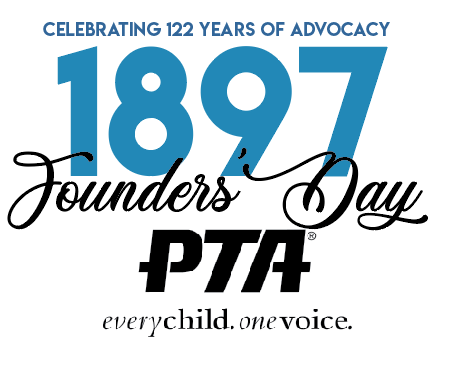 Please visit the California State PTA's website for additional information on Founder's Day!